With expertise spanning animal health, human health and infectious disease, international community development and gender issues, Dr. Hellen Amuguni is a true One Health scientist. Tufts and the University of Minnesota will be part of an international partnership of universities working to strengthen global workforce development against emerging pandemic threats. Tufts and the University of Minnesota are collaborating on a grant to explore emerging pandemic threats. This is a Tufts-generated news release. With a DVM, MA, and PhD in Infectious Disease, Dr. Hellen Amuguni is a true One Health scientist. Her perspective as a gender specialist, complements her scientific knowledge of human and animal disease with actionable insight into how culture and gender roles affect the spread of disease. Her unique qualifications are put to good use as a teacher, mentor, and technical advisor on the USAID One Health Workforce project in eight countries in Africa. As a young veterinarian in her native Kenya, Dr. Amuguni spent time in the field working with farming communities. It was through this early work that she learned that in order to be a successful veterinarian, you must also be a strong communicator, and humanitarian. 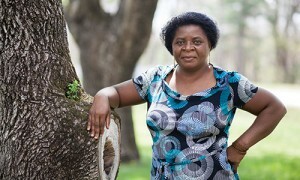 Her passion for her work helping rural communities inspired her to earn a Master’s degree in International Development. After returning to Africa to work in the field, Dr. Amuguni decided to pursue a PhD in Infectious Disease at Cummings School under renowned enteric pathologist, Dr. Saul Tzipori. Since earning her PhD, Dr. Amuguni has served as a technical advisor on the USAID One Health Workforce project for Africa, wherein she advises One Health initiatives in eight African countries. With her diverse academic expertise, field experience, and strong soft skills, Dr. Amuguni is a favorite among student and faculty alike.